Funko is of course a very popular brand and one I enjoy discussing on the blog. 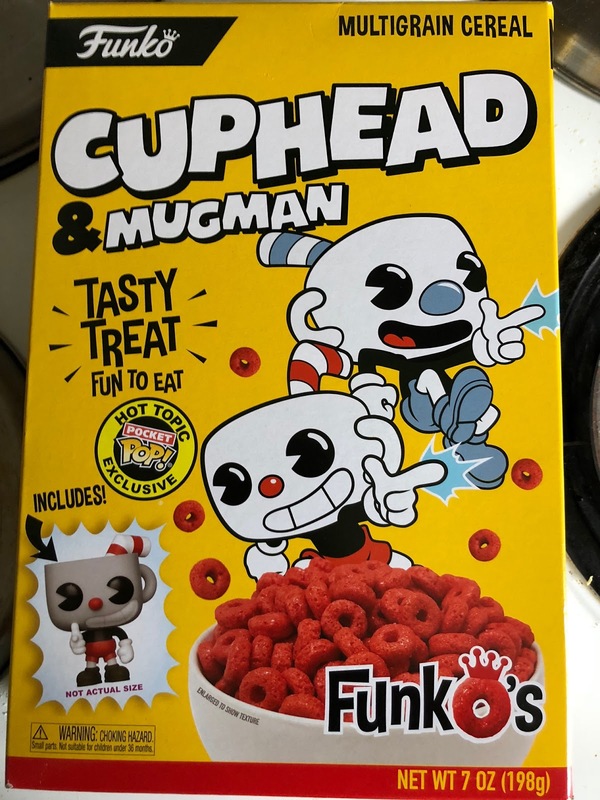 They recently have been releasing cereals that are exclusive at one store or another (e.g. you can get "Mega Man," at Gamestop, "Gollum," at Box Lunch, etc.) and I was able to purchase one found at Hot Topic, the, "Cuphead," one. 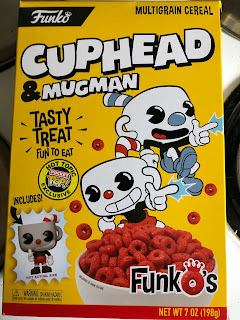 I have never played the game, but know folk like it, and it was the only cereal for sale there, so I thought I would purchase a box and see how good or bad it tasted. I mean, I know most people are buying the cereals to either keep them sealed-up and display the box, or were going to open the box for the included figure but never touch the cereal, but I was curious. That was my downfall. I opened up the cereal once it was home and the separately-bagged figure was taken out of the box by me as well--lest I get it wet. I proceeded to open the bag and was greeted with a smell similar to Fruit Loops yet somehow more artificial. I dumped it in the bowl and looked at the neon red mess contained within. Yes, I was staring into the abyss and the abyss stared back. I got my almond milk out of the refrigerator (as longtime readers know, I'm sensitive to dairy) and poured some in. I proceeded to walk into the living room and gave my wife a dry piece to try if she wanted. She bit into it and made a disgusted face. At this point I considered calling-off my plans to have a taste. I took a deep breath however, lifted the spoon to my mouth, and began chewing. If you're expecting me to say the cereal was actually good in an astonishing turn of events, I'm sorry to disappoint you. It tasted like an utterly fake mess with the most plastic cherry you could imagine. It was just nasty, and I took extra bites just to be sure if I maybe simply needed to get a taste for it. 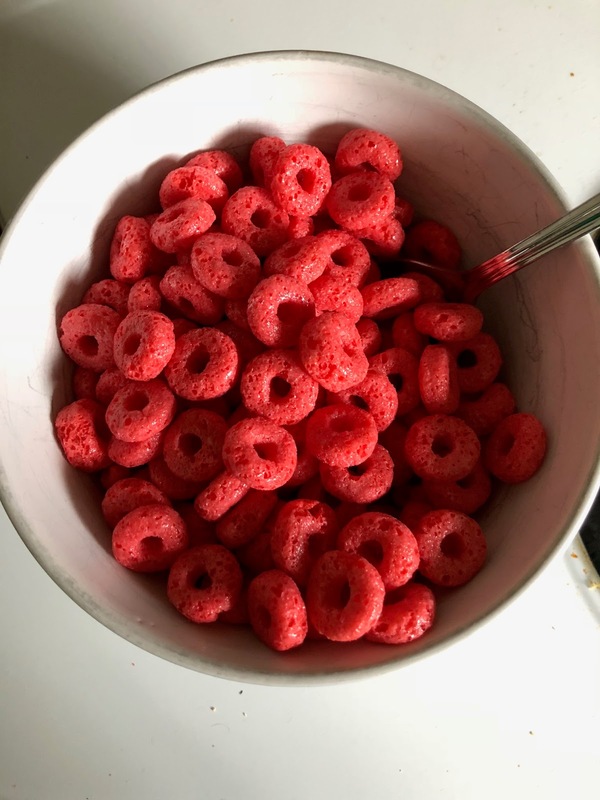 I am not some kind of cereal purist, I love all kinds and flavors from Rice Kripies, to Cap'n Crunch, Lucky Charms, Apple Jacks, generic corn flakes, and everything from the more natural to significantly sugary. This cereal was just bad. Should anyone buy a box of this to display or get the figure out of I would strongly discourage you from actually eating it. I know that sounds odd about something that is supposedly a food item, but describing what I tasted as, "Food," is generous phrasing. Consider this a cereal 0.5 out of 5 stars, with the only saving grace being it wasn't so bad I threw up.